Despite the fact it’s lighter, the Cooking Light Chocolate Cream Pie is one of my all-time favorites. Or at least it was for a while. At some point I turned my attention to richer chocolate pies and Cooking Light’s fell off the radar. But now it’s back, and with a twist! Cooking Light’s more recent Mexican Chocolate Cream Pie is similar to the original, but includes cayenne, cinnamon and espresso. As usual, Cooking Light employs tricks to keep the nutrition stats in check. For instance, the filling is made with milk rather than half & half, the pie has fewer than usual eggs, and the crust uses egg white in place of some of the butter. If you are used to richer crusts you might notice that this one has been lightened as it is not as buttery tasting. However, the filling doesn’t taste light and is as satisfying as the richer ones. Or at least in my opinion. I made a few minor changes such as adding vanilla and using whole milk, but for the most part I stuck with the recipe. I still prefer the original cayenne-free version, but this one is a nice change and would be good for a Mexican themed dinner. 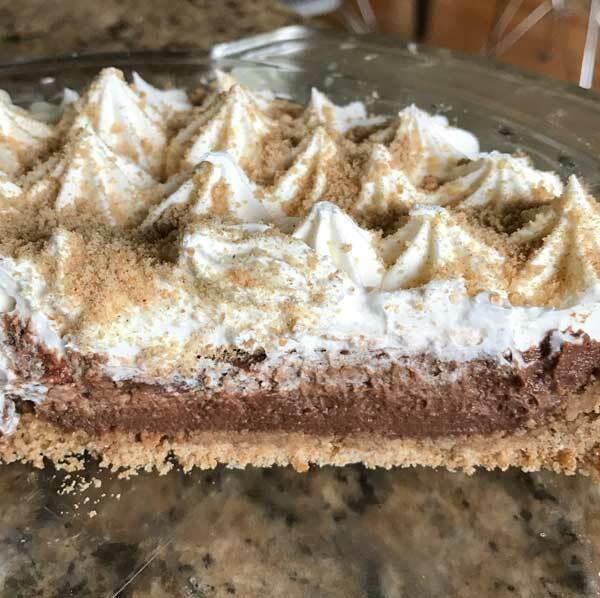 If you’re not in a the mood for Mexican Chocolate Cream Pie, here’s a link to the original Cooking Light Chocolate Cream Pie if you want to compare and contrast. Along with adding spices, they changed a few other steps as well. 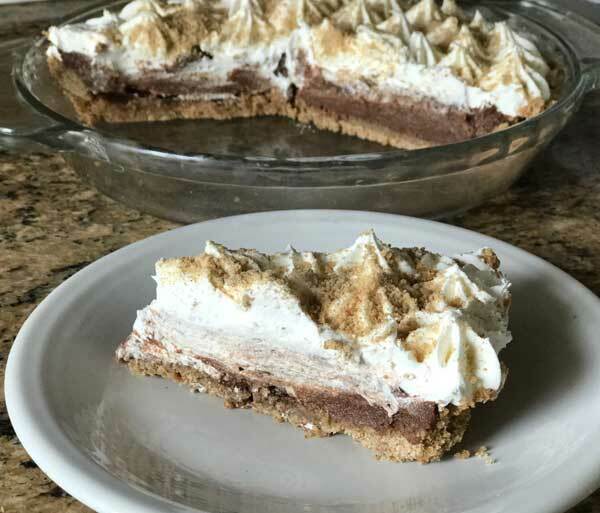 Cayenne and espresso powder along with a cinnamon spiced graham crust give this Cooking Light chocolate cream pie a Mexican twist. Preheat oven to 375°. Spray a 9 inch glass pie dish with cooking spray. Crust: Set aside 1 tablespoon of the crumbs, then mix the remaining crumbs with the 2 tablespoons sugar, cinnamon, and salt. Add the butter and stir until mixed, then stir in the egg white. Press crumb mixture into bottom and up sides of pie dish and bake at 375° for about 8 minutes. Let cool. Filling Whisk sugar, cornstarch, cocoa, salt, espresso, pepper, egg and yolk together in a bowl. Place milk in a medium, heavy saucepan over medium-high heat; cook until milk reaches 180° or until tiny bubbles form around edge (do not boil). Gradually add hot milk to egg mixture, stirring constantly with a whisk. Return milk mixture to pan. Cook, stirring constantly, until mixture thickens (recipe say 10 minutes, but mine was thick in about 3 so I did 5). Remove from heat. Add chocolate and stir until melted, then stir in the vanilla. Place the saucepan in a large bowl of ice water so that the ice water comes up around the sides. Whisk, then let stand for about 10 minutes, whisking often, to quick cool. Pour filling into crust, and cover surface of filling with plastic wrap. Chill for 3 hours or until set; remove plastic wrap. 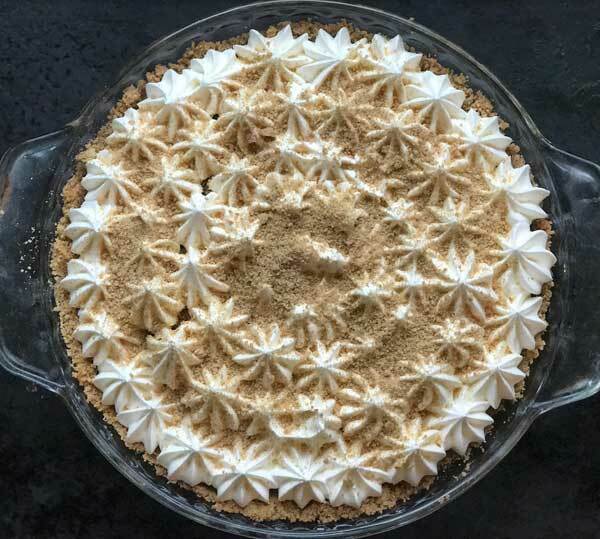 Spread or pipe whipped topping over pie; sprinkle with reserved cracker crumbs. This pie is pretty sweet. We liked the sweetness level, but next time I might try using a 75 or 80% cacao for the chocolate rather than regular semisweet or dark.